The Department of the Interior’s Bureau of Land Management (BLM), and the U.S. Departments of Energy, Agriculture, Commerce and Defense today released for public review and comment a draft programmatic environmental impact statement (draft PEIS) proposing designation of energy transport corridors on federal lands in 11 western states in accordance with Section 368 of the Energy Policy Act of 2005. 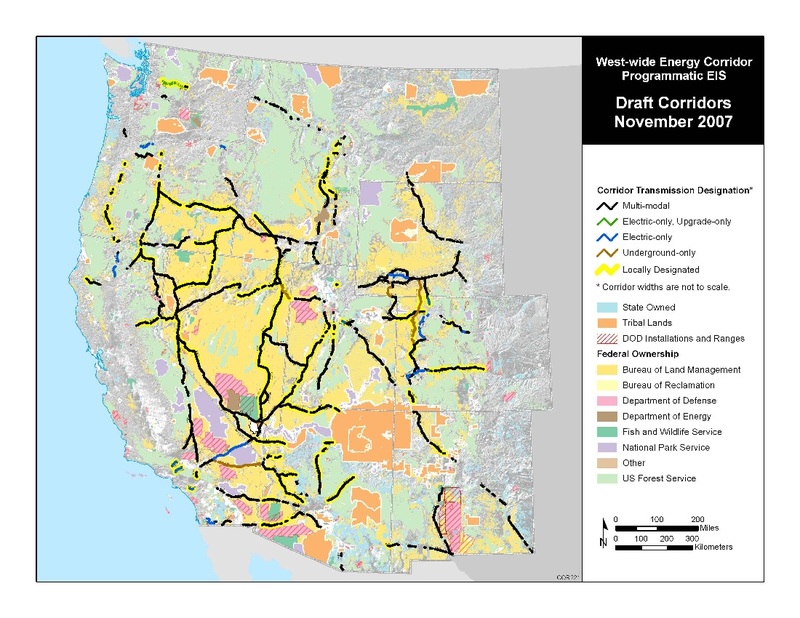 The proposed energy corridors would facilitate future siting of oil, gas, and hydrogen pipelines and electricity transmission and distribution on federal lands in the West to help address growing energy demand while protecting the environment. The Energy Policy Act of 2005 directs the secretaries of Agriculture, Commerce, Defense, Energy, and the Interior to designate energy transport corridors for oil, gas, and hydrogen pipelines and electricity transmission and distribution facilities on federal lands in portions of Arizona, California, Colorado, Idaho, Montana, Nevada, New Mexico, Oregon, Utah, Washington and Wyoming. The Act further directs that environmental reviews be completed for the designation of such corridors, and that the designated corridors are incorporated into the relevant agency land use and resource management plans or equivalent plans. Eighty-four percent of the corridors proposed and analyzed in the draft PEIS are located on BLM-managed lands, while 14 percent are on USDA Forest Service lands. The remaining fractional percentages are on lands managed by the Department of the Interior’s Fish and Wildlife Service, Bureau of Reclamation and National Park Service, or by the Department of Defense. The proposed corridors are agency-preferred locations for siting of future pipelines and transmission lines. Interested members of the public, government agencies, American Indian tribes, states, and non-governmental organizations are invited to submit comments on the draft PEIS. The draft PEIS evaluated factors that constrain where a network of energy transport corridors could be located – including topographical, environmental and regulatory constraints – as well as the overall suitability of particular lands to support development and operation of energy transport infrastructure. As a result of an inclusive public scoping effort over the past two years, including regional meetings and public review of preliminary corridor location maps, the draft PEIS proposal avoids major known and designated sensitive resource areas including wilderness areas and national parks, tribal lands, national monuments and national recreation areas, wherever possible. The few locations where the proposed corridors could not avoid sensitive areas are located along existing transmission lines, highways, pipelines or other rights-of-way. The agencies will solicit comments during a 90-day public comment period on the draft PEIS. Public meetings will be held in each of the 11 states and in Washington, D.C. During this period, briefings and consultation will continue to occur with each governor’s office, tribes, Congress, and historic preservation officials. January 8, 2008 – Portland, Ore., and Sacramento, Calif.
January 10 – Seattle, Wash. and Ontario, Calif.
January 15 – Phoenix, Ariz. and Grand Junction, Colo.
January 17 – Las Vegas, Nev. and Salt Lake City, Ut. January 23 – Window Rock, Ariz.
January 24 – Albuquerque, N.M.
January 29 – Helena, Mont., and Cheyenne, Wyo. January 31 – Boise, Id. and Denver, Colo.
To submit comments and to review the draft PEIS and related documents, including detailed maps, visit the project website at http://corridoreis.anl.gov. Review copies are also available at libraries and agency regional and field offices. The draft PEIS will also be published in the Federal Register on Friday, November 16, 2007, which initiates the 90-day public comment period.